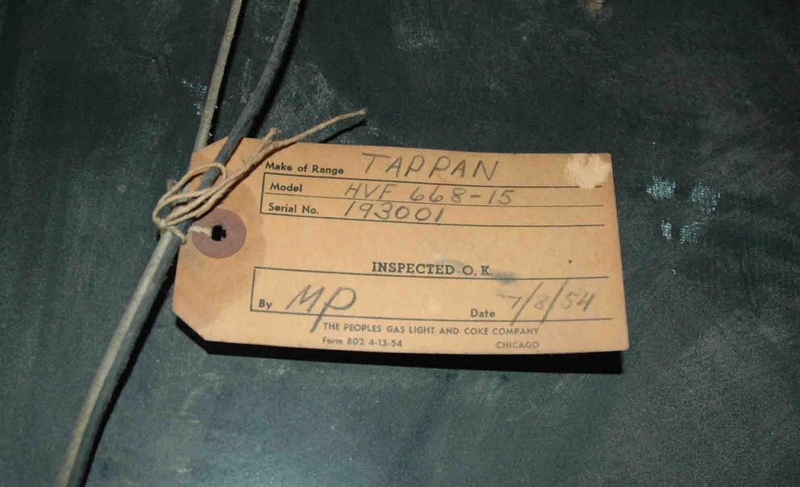 "We are looking for an age for our Tappan Deluxe. HDV 64 -3 Serial number 254710. My husband grabbed this almost 20 years ago “free for taking”. It is my prized possession…I absolutely love it! 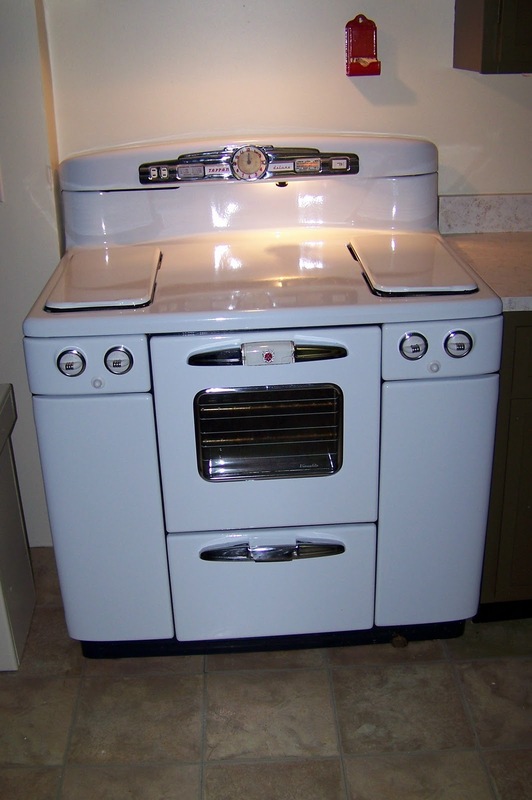 We we’re so happy to find your blog…we have searched for years for info On these old stoves! Thanks for any input you can give us!" 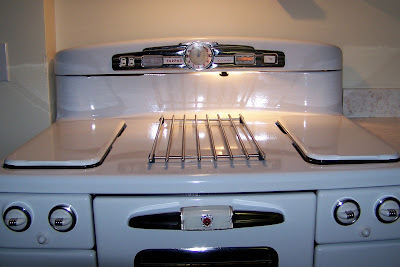 The things I noticed about the stove: The model is a later version of the Deluxe...early 1950's. Probably '52 - '54. 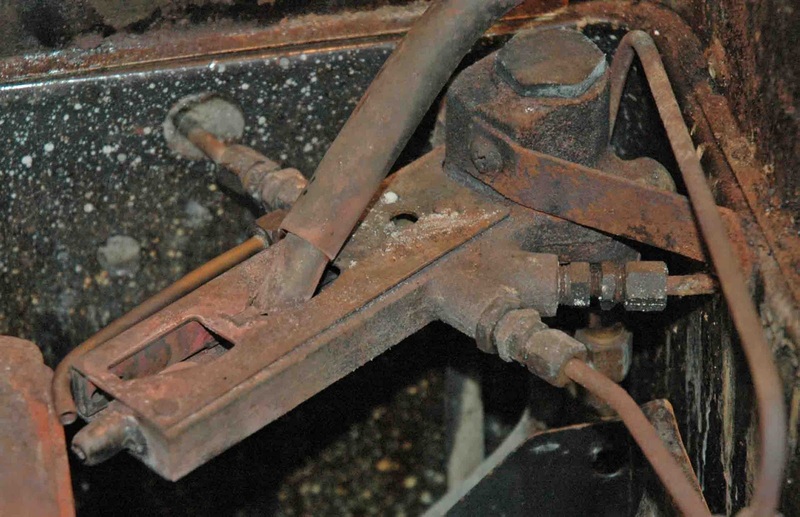 The broiler foot pedal was a later option. The stove has Telechron clock which is a little unusual for the later models which seems to have the time control clock. The clock also has chrome knobs...which is a nice feature :) It's also a little unusual for this model to be a non-CP (without a standing pilot). These later stoves seems to almost be made to order because there is so much variance in the features. 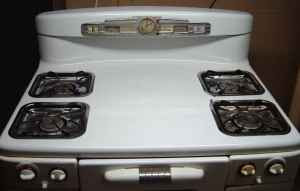 The stove has those very nice chrome burner knob backs...those are special! 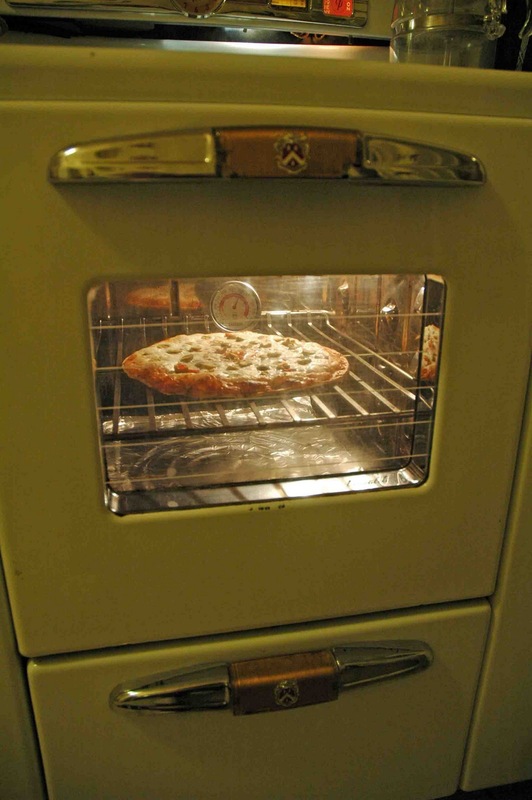 "Just wanted to let you know… I told you our Tappan oven was not working….not getting hot. We had the oven pulled out, so we took everything apart, Tom wanted To make sure that is was the oven control before we sent it away to be rebuilt. 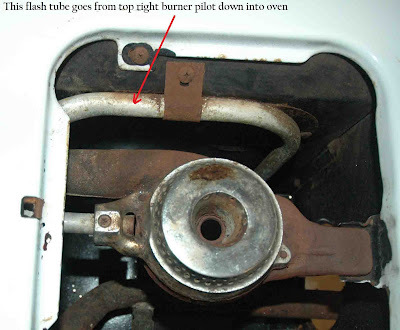 After taking the burners completely out and cleaning them, they did not work right either! 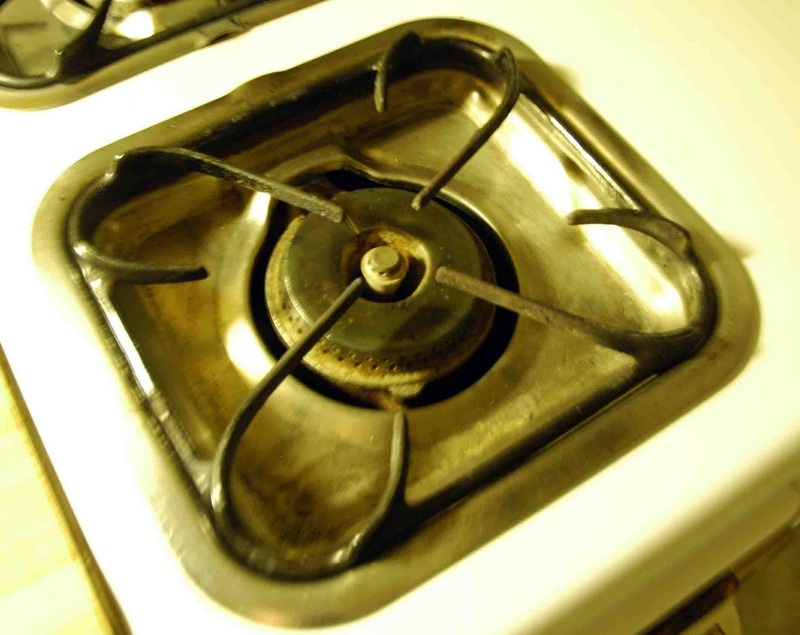 If you got one burner lit, and lit another, the first one would go out! So Tom checked the gas line, low pressure! 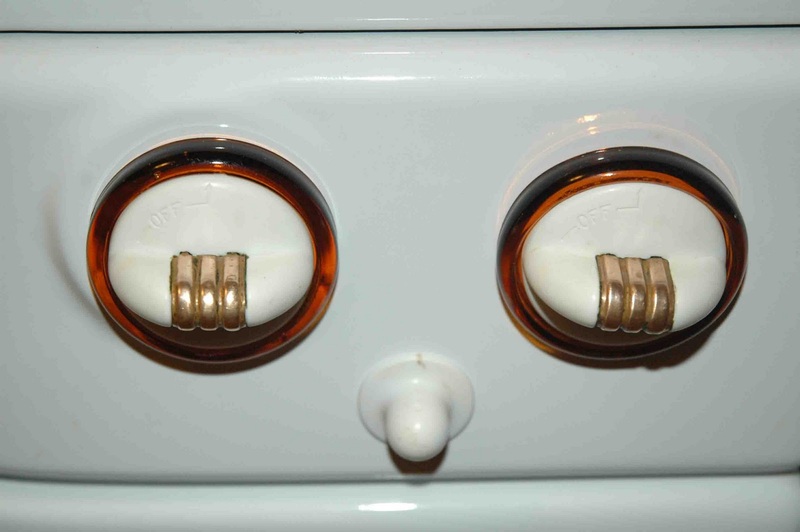 He went down and tried to light the hot water tank… It had low gas pressure. We called the gas company. Our meter was broke, they replaced it. While we have the “old girl” pulled out he is replacing the flexible gas line, then I should be BAKING Christmas cookies!!" Connie and Tom - Thanks for sharing your photos and info.! I have a treat for you today. I am going to share string of emails I exchanged with Jeff, a Tappan Talk reader. Jeff also shared some great pictures of his new stove and some of his restoration activity. Take a look at the very unusual standing pilot system. 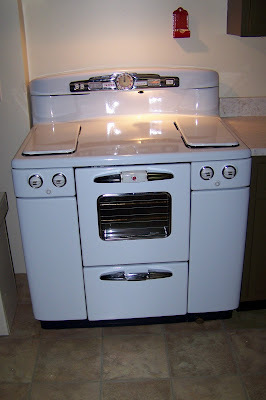 Also, notice the nice shot of the foot pedal on the base of the stove that opens the broiler. "Hi, I love your wonderful blog on the old Tappan stoves. I found a Tappan Deluxe in [Iowa]. Last Saturday I rented a van and drove from [Wisconsin] to [Iowa] and picked it up. It was in a 1950's brick, ranch style house. It was being sold by the daughter of the original owners. She thought it was a 1952 model. I spent all day Sunday cleaning it. I have to say, after working on old cars, radios and outboard motors looking under the hood of an old stove is very depressing. Lots of rust and grease. 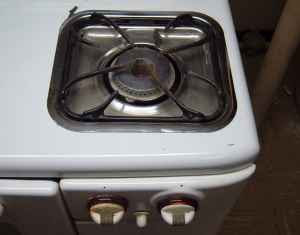 But no matter the stove is hooked up and working. A few interesting details. The tag on the back of the stove has a date of July 8, 1954 and was apparently sold by The Peoples Gas Light and Coke Company in Chicago. This stove is a CP model but there is no standing pilot in the oven. 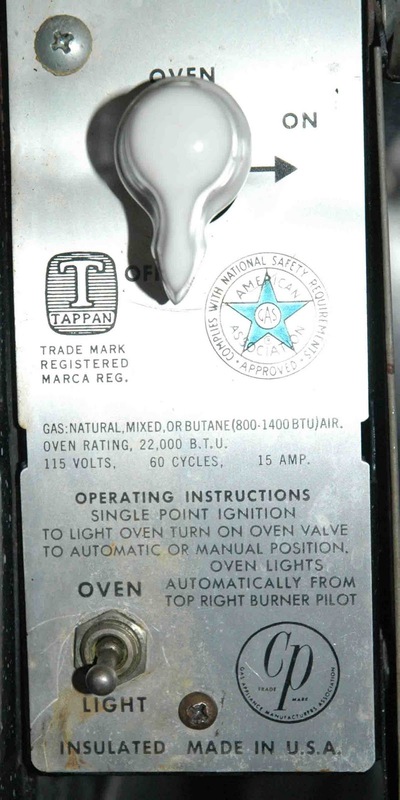 Instead the oven uses the top right burner pilot and is described a single point ignition on the oven control panel. It has amber burner rings, gold details, simmer burners and pyro-grates. It does not have the chrome window trim however. It has one last test to pass. I need to see if the oven thermostat is working. Cross your fingers!" "Wow, that stove is excellent. 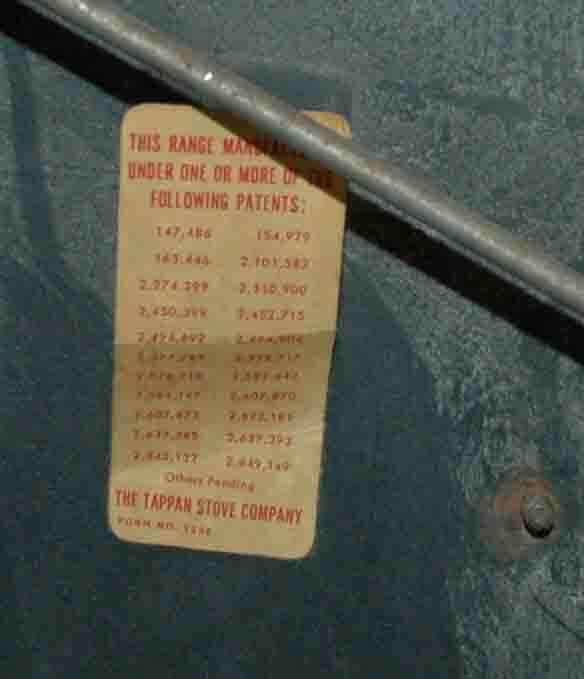 I'm curious if the tag on the back is indicating that the gas company sold the stove....or the date they hooked it up & inspected it. Very interesting. Also, the standing pilot configuration is something I have never seen before. 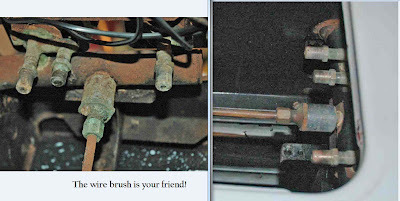 Just when we think we have seen everything, I get en email with something new :) I was amazed at how much of the "rust" actually washed away on the parts under the top of my stove. 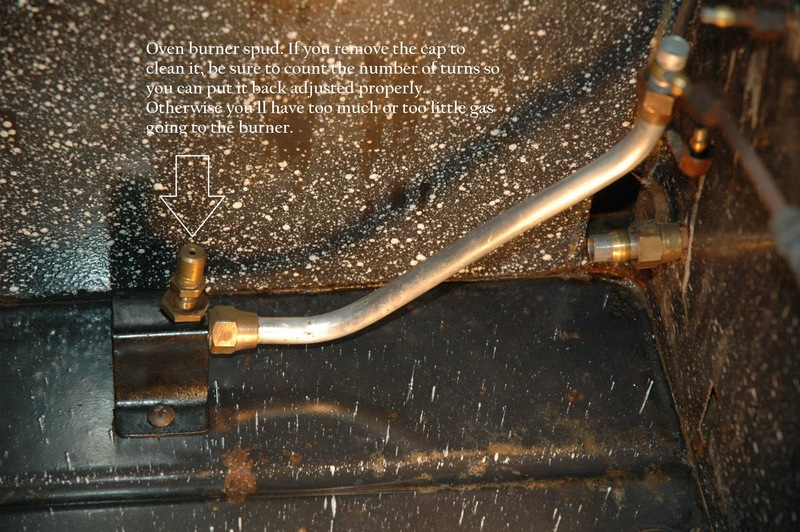 Pull out the burners & wash them and it will give you an idea if the rest if surface or not. Also, anything that does not touch a flame, can be touched up with black high heat paint - looks good and also keeps the rust in check. Well, worth the drive to pick her up!!! Tappan Talk"
"Hello, Thanks for all the work you do to post reader's stories and pics. Your site is very informative and helpful. Now that you mention it, I believe you are right that the tag was probably from the gas company that hooked up the stove. The house that the stove was in is for sale and I looked up the info about the house. It was built in 1957 so I think the daughter's parents must have either bought the stove used or lived someplace near Chicago when it was purchased new. I wrote her today and asked for more details so maybe the date can be nailed down with more certainty. Thanks! 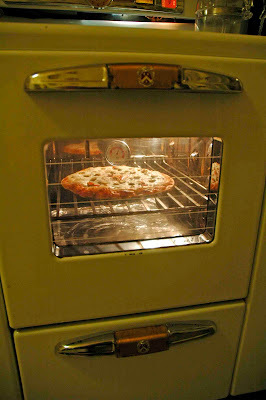 Jeff"
"Well I crossed my fingers but the oven on my Tappan Deluxe from [Iowa] was not happy. My oven has a very complicated safety/ignitor called a Bryant Type JSP Range-Lyter. It controls gas through 6 connections and there are 3 pilots involved in running the oven!! I wish my stove had the simple "push the red button" type safety. I had to remove the safety and send it off [for] a rebuild at $195. I included a pic of the part. Jeff"
"Too bad that your safety needs to be rebuilt, but I suppose we are lucky that there are still folks available to do it. Tappan Talk"
"Hello again, Here are some before and after pics of my Tappan Deluxe from [Iowa]. 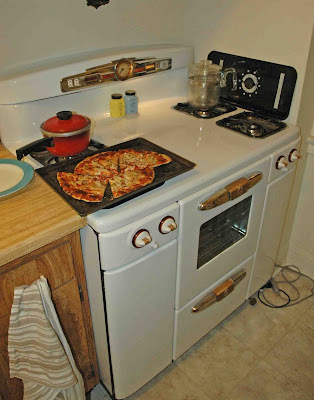 The oven safety was rebuilt [and] the safety is working ok and the oven is baking pizza! I took the top off and cleaned up all the grease and dirt, removed the surface rust, treated it with Rust Reformer and painted it with high heat black paint. I did the same to the front brackets that hold down the top. I'm really glad to know that things are clean and the rust is under control! 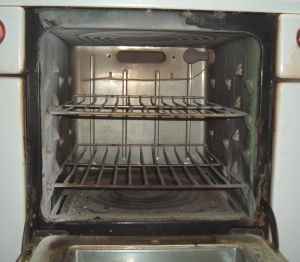 I removed the oven burner, burner spud and holder and cleaned out the oven. I repainted the spud holder and cleaned up the gas lines. Gallons and gallons of black water have gone down the drain. I ordered some teflon insulated wire from www.bulkwire.com and some ceramic wire nuts from McMaster Carr and my last project is to rewire the burner control back-lighting. Wow what a project! As you might be able to tell from the pics, the stove just fits into the space. There are only fractions of an inch of wiggle room. I live in an apartment building built in 1916 [Wisconsin]. The counter tops and cupboards in my kitchen are pretty horrible but the stove is working! I took the Visiminder works to a clock shop to be reassembled after I got in over my head LOL. I will give you an update on that soon." "Thanks for the update! I'm anxious to get to your stove, as the pilot arrangement is so unusual. I do have instructions on adjusting the oven burner spud, if you ever need them. 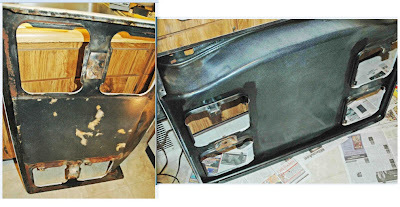 TT"
Jeff, thanks for sharing your great photos & restoration info! Here are the Craigslist pictures of my new beauty. She's a CP, model AV 667 9E, and seems, to my untrained eye, to be in pretty good shape. 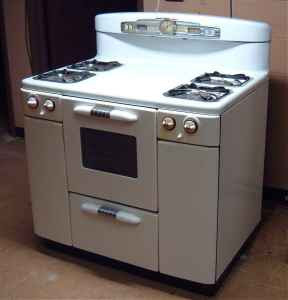 I think now you can see why I believe she resembles Ron and Aiden's stove, but may be a tad newer because our respective stoves have different model numbers and because their stovetop light has a chain pull, which mine doesn't. I don't know where to find information regarding her actual age. I'm only doing cleaning and other minor aesthetic tasks at present, but one thing I cannot do is figure out whether or not I can remove the chrome Logo/Clock/Timer/Roasting Temp. plaque (for lack of a better description) on the backsplash. It is very, very pitted and decidedly unattractive and if I could safely take it off someone somewhere might be able to restore it. Does anyone know if the thing is actually removable?" 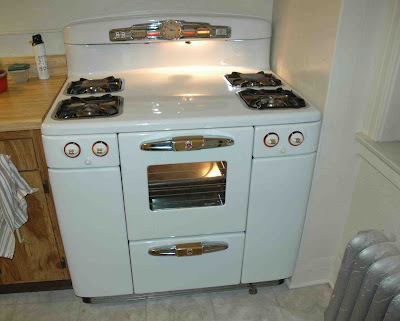 Sara and I exchanged a few emails on starting to restore a "new to you" stove. My advice: The easiest place to start is cleaning, if course. The burners pull out. There are also drip drawers that are directly under the burners that pull out. Most people don't notice these, so they were rarely cleaned over the years. They are at the top of the side storage areas and just slide out for cleaning. Mine were disgusting, but cleaned up to look like new. I find those cleaning "miracle erasers" work really well for cleaning. Also, the bottom plates in the oven lift out for cleaning. Can anyone answer Sara's question about removing the back splash trim? What do you think the model year is? Sara, thanks for sharing pictures of your new purchase!